Contact one of our representatives to create your custom bar at no extra charge! 1-866-446-4040. 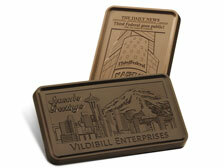 Unique engraving on bars made of delectable Belgian chocolate make very effective personal and business gifts. You business associates and friends will love our ½ lb Executive Bars that are smaller, but equally delicious versions of the 2lb bars. These pieces are all 9” x 5” x 3/8” in size. No extra charges are made for the customization of the candy bars. No need to order gift wrap, our stylish boxes complete your gift presentation at no additional charge.